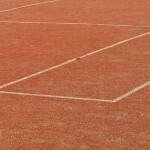 The IR heating ribbons provide the perfect solution when it comes to keeping tennis courts, and gravel courts in particular, free of snow and frost. HSI’s field heating system offers the best quality/price ratio. The heating system will automatically (dis)engage based on preset parameters. This means that the heating system will only be in operation when and where required. All heating systems are provided with remote control. It is also possible to apply section heating. The short warming-up time, efficient system operation (only when required) in combination with the restricted energy consumption – as a result of the unique combination of IR heating ribbons and system control – make the HSI heating system the most economical worldwide. HSI’s heating system is suitable for application under various top layers. The heating ribbons are installed at a depth of 7cm below the gravel layer. The mutual distance (centre-to-centre) between the heating ribbons amounts to 20 cm. The heating ribbons are installed at a depth of 7cm below the top layer. The mutual distance (centre-to-centre) between the heating ribbons amounts to 20 cm. 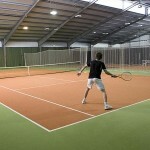 IR floor heating: the ideal solutions for heating indoor sports centres. The instant radiant heat which is emitted benefits the players.